Just for the record, our brother-in-law Chikara is aboard this trip too. And his only desire is to watch a Thai Boxing match, his sport when he was younger (he is still young). With the lined up shopping spree he had to endure traveling with 75% of the Cobis, we decided to give in to this tiny request. We thought it will be interesting and cultural to watch a live Muay Thai in Bangkok anyway. 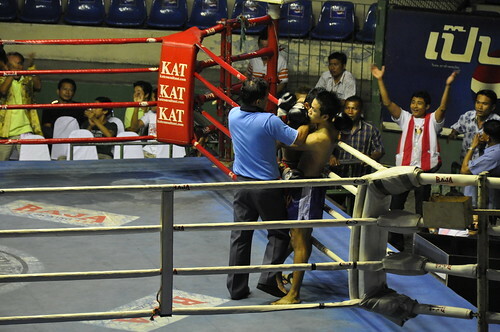 Muay Thai or Thai Boxing is the national sport of Thailand. 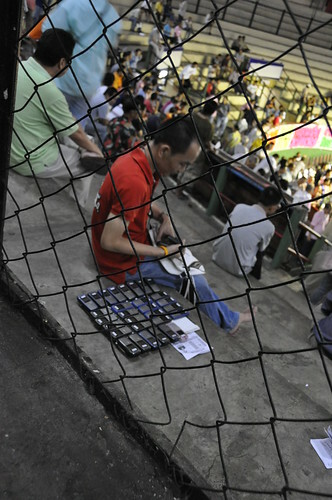 It’s a popular sport and you can find many stadiums around Bangkok. The 2 most popular though are Lumpini and Ratchadamnoen and fights are scheduled so that you can watch everyday. Driver: hey, tuktuk? where you going? Driver: ok, ok, 30B for 4 persons. There are 3 classes of tickets: 1000, 1500, 2000 baht. The driver took us to a travel agency where he said we should buy the tickets from. Perhaps he can get a commission there but the agent doesn’t sell 3rd class (1000) tickets, which is what we were willing to pay. I know already that tickets can be bought outside the stadium but they (driver and agent) made us think that we may not be able to get seats or that the 3rd class will be so far that we couldn’t see anything. But don’t be fooled!!! If you’re not an absolute fan that need to touch the boxers, class 3 is just fine There were 7 matches to watch that day starting at 5pm. look at the empty seats! Fight Schedule: Tuesdays and Fridays from 06.30 pm, Saturday afternoons 05.00-08.00 pm., Saturday nights from 8.30 pm. Fight Schedule: Mondays, Wednesdays and Thursdays at 06.00 pm., Thursdays at 05.00 pm. and 09.00 pm., and Sundays, starting at 04.00 pm. and 08.00 pm.